Hey!!! 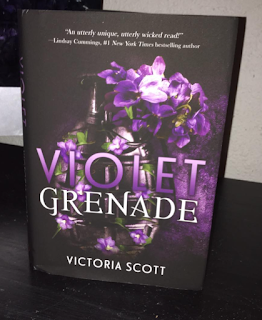 fellow book lovers, welcome back to my latest blog about the Book Violet Grenade. I first would like to say thank you to entangled teen for sending me this book in order to review it. I always appreciate the chance to read new books especially by authors I have never read before. The author of this book is Mrs Victoria Scott and this book is label as a Psychological thriller, which is very much true. This book reminds me of Alfred Hitchcock movies.Now on to the best part of the blog, the reviewing part. So here is the summary of the story. The story involves four main characters but I would say there is more then four.The main four listed in the original book summary are as follows, Cain, Madam Karina, Wilson and of Course Domino the main lead female. But I would also like to add Poppet who is a girl that enters the story half way through the book. But lets go back to the beginning of the story. See Domino ends up in trouble at the beginning of the book which is when we also meet Wilson. Hell breaks loose and then enters Madam Karina who claims to offer young girls honest work and a safe home. Domino decides to take Madam Karina up on her offer. She ends up in Texas working for Madam Karina at a entertainers house of sorts. But after she arrives she meets Cain and Poppet. Poppet immediately befriends Domino and tries to help her out. Cain slowly warms up to Domino and begins to reveal who he truly is and why he is there. But the other girls not so much, they give Domino a lot of trouble which causes Wilson to return and so begins the story. Now onto my thoughts of the book. Lets start with Madam Karina, I knew she was trouble the moment she started talking. I knew she would bring more pain to the story. Wilson is just a creepy character all around, along with Cain as you learn more of their life and past . As for Poppet well I just felt sorry for her and what she had to face. All of these people end up at Madam Karina’s for different reasons, and its almost like the Bates hotel, once you check in, you can’t just check out. These characters are really dark and twisted which creeps up on you slowly as you read the book. I would say more but then that would be spoilers of the book. As for the book, I rated it 3 stars out of 5. The reason for Three stars is because Victoria writing is really amazing. The way she uses words to tell the story is so beautiful and so deep. She can really paint the image for you. But this book is really dark and gritty as it is describe and it was not my cup tea. I don’t actually remember what attracted me to this book but that is just my opinion. I also would like to add that I will read other Victoria Scott books. This one book is not going to change my thoughts on how wonderful this Author writing is. But back to the book, if you love the show Bates motel or Dexter, you will love this book. This book is for people who like the Dresden files books. It really does twist your mind and help you to imagine the most dark and twisted world possible. Sometimes you can totally see how Victoria uses the real world to influence Domino's world in the book. So if you don’t mind dark twist gritty mystery novels, then this is totally the book for you. If you want to read this book it will be available on May 16th, 2017. Once again I would like to thank Entangled teens for giving me the chance to review this book. I can’t tell you enough how much I appreciate getting a chance to review any book. Also all the links for the book, the author and my social media are listed below like always. Thanks everyone for reading my latest blog.